Big Jim Torch Battery. 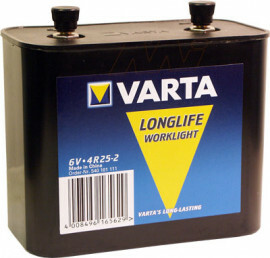 Specialised Carbon Zinc Battery Lantern Battery Application : Lantern, Torch Chemistry: Extra Heavy Duty Zinc Chloride Voltage: 6V Nominal Capacity: 19000mAh Brand: Varta Size: Lantern Width:136.5mm Height: 114mm Length/Breadth/Depth: 73mm Weight 1200g Varta Longlife batteries are Zinc Chloride batteries, the equivalent to other brands ‘Extra Heavy Duty’. These batteries delivery superior performance compared to carbon zinc ‘Heavy Duty’ or ‘General Purpose’ batteries.